Anna Richardson and Levi Houghton declared their intentions of marriage on Oct 7, 1763 Lancaster, Worcester Co., MA, USA; JWH: 1,2,1763. Anna Richardson married Levi Houghton, son of James Houghton Jr. & Sr. and Sarah (? ), in Nov 2, 1763 at Lancaster, Worcester Co., MA, USA. Phinehas Houghton married Eunice Rogers in Nov 28, 1763 at Bolton, Worcester Co., MA, USA. Marriage Feb 20, 1770 New York, New York Co., NY, USA, MLM: Mg. Bonds, Vol. of Endorsed Mg. Bonds. After the evacuation of the British in 1783, the practice of issuing licenses largely ceased. See Licenses of the Province of New York Prior to 1784, 1860, p. 9. The original records were destroyed at the time of the capital fire at Albany in 1927 (vol. 16, p. 25). If John's wife was born 1759, she would have been listed in the 26-45 column as a 41-year old. Assuming of course that the census was correct. 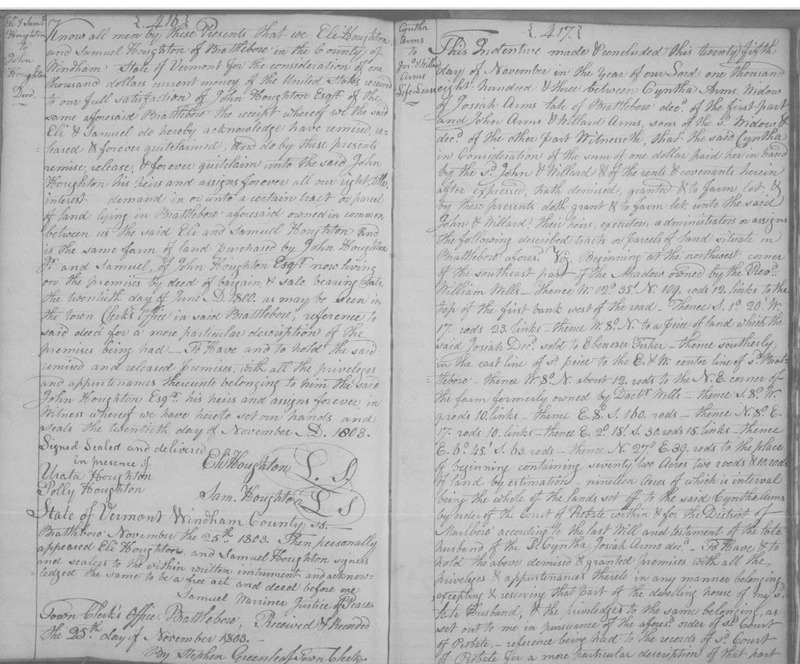 Death Jun 11, 1826 Guilford, Windham Co., VT, USA, JWH: "aged 99 years and 4 days"; MLM: "according to the unpublished records of Christ Church (Episcopal) of East Guilford, or Algiers, Windham Co., Vermont, the death occurring at the home of his son, Eli Houghton. At the time of his death, both in the church records mentioned and in contemporary Greenfield, Massachusetts, paper, his age was given as one hundred and one years, but the official record is very clear, and it may be supposed that the old gentleman gradually got to thinking of himself as two years older than he really was. Actually, he was 99 years old when he died. neither his burial place nor those of his three wives are known, consequently, no headstones, as far as I know (H.A.H.) However it is a fair guess that he and his second and third wives found terminal resting places in the cemetery on the meeting house hill, Brattleboro." Hx of Berlin MA: another John Houghton, called John Tirtius, 3d, sold the place "where he lately dwelt" to Judge Samuel Baker in 1765. No record of his lineage, but his wife was Mary Goddard, the dau. of William Goddard, the miller. They rem. to Brattleboro, Vt., and later to Guilford, where he d. in 1826, aged 101 yrs. John Houghton 3d married Mary Goddard Mary in Bolton VRs; Vermont Fam. : c 1749, Lancaster MA. John Houghton 3d married Susannah Dodge in Feb 20, 1770 at New York, New York Co., NY, USA, MLM: Mg. Bonds, Vol. of Endorsed Mg. Bonds. After the evacuation of the British in 1783, the practice of issuing licenses largely ceased. See Licenses of the Province of New York Prior to 1784, 1860, p. 9. The original records were destroyed at the time of the capital fire at Albany in 1927 (vol. 16, p. 25). John Houghton 3d married Sarah Rice in Sep 9, 1798 at Guilford, Windham Co., VT, USA, w/3; no issue. Ruth Osgood married Phinehas Houghton, son of Deacon Israel Houghton and Martha Wheelock, in Jun 6, 1753 at Lancaster, Worcester Co., MA, USA. Mary Goddard married John Houghton 3d, son of John Houghton and Mehitable Wilson, Mary in Bolton VRs; Vermont Fam. : c 1749, Lancaster MA. Sarah Rice married John Houghton 3d, son of John Houghton and Mehitable Wilson, in Sep 9, 1798 at Guilford, Windham Co., VT, USA, w/3; no issue. James Houghton married Phoebe Holt in Sep 11, 1755 at Andover, Essex Co., MA, USA, JWH: 11 Sep 1763. Experience Houghton married James Bartlett in Jun 13, 1771 at Union, Tolland Co., CT, USA. Mary Houghton married Daniel Hendrick in May 27, 1752 at Union, Tolland Co., CT, USA. Cornelius Houghton and Abigail Garfield declared their intentions of marriage on Jul 18, 1773 Leicester, Worcester Co., MA, USA. Cornelius Houghton married Abigail Garfield in Aug 5, 1773 at Sutton, Worcester Co., MA, USA, IGI: 18 Jul 1773; VanNoy: 6 Feb 1773, Leicester. Capt. Nehemiah Houghton married Eunice Curtice in Dec 19, 1759 at Oxford, Worcester Co., MA, USA. Edward Houghton Jr. married Olive Russell in May 30, 1771 at Thompson, Windham Co., CT, USA, MLM: 1772; Wallin: prob. Killingly, CT. Marriage Jun 23, 1768 Union, Tolland Co., CT, USA, Richard Houghton III: "Bowman collection, CT State Lib., Union Church Recs., p. 7 (giving date as 1767)(citing 1Union Recs., p. 38);Early CT Marriages (giving date only as ---24, 1768). Burial after Apr 17, 1829 Wales, Hampden Co., MA, USA, on his farm; with his son Asa Jr. and grandson Asa B.
Asa Houghton married Sybil Davis in Jun 23, 1768 at Union, Tolland Co., CT, USA, Richard Houghton III: "Bowman collection, CT State Lib., Union Church Recs., p. 7 (giving date as 1767)(citing 1Union Recs., p. 38);Early CT Marriages (giving date only as ---24, 1768). Asa Houghton and Mary Bradford declared their intentions of marriage on Feb 5, 1791 Sturbridge, Worcester Co., MA, USA. Asa Houghton and Mary Bradford declared their intentions of marriage on Feb 6, 1791 Wales, Hampden Co., MA, USA. Asa Houghton married Mary Bradford in Mar, 1791 at Wales, Hampden Co., MA, USA. Asa Houghton married Susanna A. Gardner in Jul 11, 1814 at Wales, Hampden Co., MA, USA. Abijah Houghton married Rebecca Adams in Oct 17, 1768 at Woodstock, Windham Co., CT, USA, Bosley: "Before my mother died she wrote a letter to the town clerk of Woodstock, Conn. asking for a copy of the marriage record of Elijah Houghton and Rebekah Adams in Woodstock, Conn. She received back a photocopy of "Woodstock Vital Records" stating "Elijah Holton of Killingly & Rebecca Adams of Woodstock were Married October 17th 1770 by the Rev. Abel Stiles Pastor"; MLM: Sherburne, MA; VanNoy: Nov. 17. Jonas Houghton married Sarah Abbott in Nov 29, 1768 at Union, Tolland, VT, USA, VanNoy: 24 Jan 1768. Death Mar 1, 1796 Groversdale, CT, USA, Houghton: Died "by drowning while attempting to cross French River, Groversdale, Conn. The bridge broke, throwing herself and horse into the river, where she was found the next morning." Phoebe Holt married James Houghton, son of Edward Houghton and Abigail McCoy, in Sep 11, 1755 at Andover, Essex Co., MA, USA, JWH: 11 Sep 1763. James Bartlett married Experience Houghton, daughter of Edward Houghton and Abigail McCoy, in Jun 13, 1771 at Union, Tolland Co., CT, USA. Death Dec, 1822 Groton, Middlesex Co., MA, USA, at home of son Joel; JWH: 6 Feb 1822; Groton VR: a. 72 y.
Burial New Cemetery, Groton, MA, USA, same lot as son Joel; "His Mother died Feb. 6, 1822, Aged 72"
Abigail Garfield and Cornelius Houghton declared their intentions of marriage on Jul 18, 1773 Leicester, Worcester Co., MA, USA. Abigail Garfield married Cornelius Houghton, son of Edward Houghton and Abigail McCoy, in Aug 5, 1773 at Sutton, Worcester Co., MA, USA, IGI: 18 Jul 1773; VanNoy: 6 Feb 1773, Leicester. Burial Evergreen Cemetery, Winchester, Cheshire, USA, "Mrs. Eunice Houghton Relict of Capt. 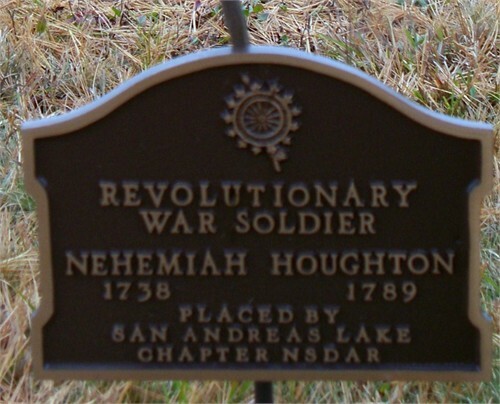 Nehemiah Houghton who Died Oct the 11, 1791 in the 56th year of her age." Eunice Curtice married Capt. Nehemiah Houghton, son of Edward Houghton and Abigail McCoy, in Dec 19, 1759 at Oxford, Worcester Co., MA, USA. Olive Russell married Edward Houghton Jr., son of Edward Houghton and Abigail McCoy, in May 30, 1771 at Thompson, Windham Co., CT, USA, MLM: 1772; Wallin: prob. Killingly, CT.
Sybil Davis married Asa Houghton, son of Edward Houghton and Abigail McCoy, in Jun 23, 1768 at Union, Tolland Co., CT, USA, Richard Houghton III: "Bowman collection, CT State Lib., Union Church Recs., p. 7 (giving date as 1767)(citing 1Union Recs., p. 38);Early CT Marriages (giving date only as ---24, 1768). Mary Bradford and Asa Houghton declared their intentions of marriage on Feb 5, 1791 Sturbridge, Worcester Co., MA, USA. Mary Bradford and Asa Houghton declared their intentions of marriage on Feb 6, 1791 Wales, Hampden Co., MA, USA. Mary Bradford married Asa Houghton, son of Edward Houghton and Abigail McCoy, in Mar, 1791 at Wales, Hampden Co., MA, USA. Susanna A. Gardner married Asa Houghton, son of Edward Houghton and Abigail McCoy, in Jul 11, 1814 at Wales, Hampden Co., MA, USA.